Fill the large bag half full of ice, and add the rock salt. 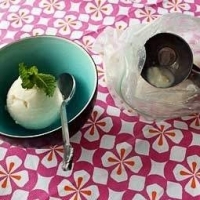 A 1/2 cup milk will make about 1 scoop of ice cream, so double the recipe if you want more. But don't increase the proportions more that that -- a large amount might be too big for kids to pick-up because the ice itself is heavy. This is a great idea. Thanks Karlyn for posting it! Be sure to use freezer grade bags, because otherwise the ice cream will taste salty!! Enjoy!